Most eBay users spend their time hunting for specific items — say, Barbie dolls, designer dresses, plumbing supplies, or smartphone accessories. That’s why eBay came up with the Lists area of your My eBay page. Whenever you view your My eBay Lists links, you see a list of your watched items, favorite searches, and sellers. But because eBay isn’t psychic, you have to tell it what you want listed. You’ll probably be looking for similar things and sellers over and over. 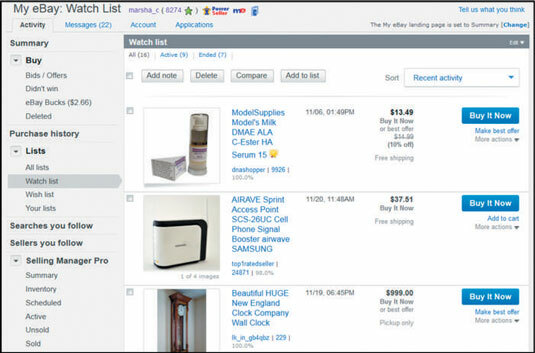 The My eBay Lists area allows you to make note of your favorite searches and sellers. You can perform these searches and visit these stores with a click of your mouse. You have the opportunity to list a bunch of searches here. When you want to repeat one of these searches, just click the Search name to search for the item. eBay will even e-mail you your searches when new items are listed. To add a search to your favorites, first perform the search. When the search appears on your screen, click the Follow This Search link, as shown at the top of the search results. The search is now transported to your My eBay Lists, Searches You Follow area for that particular search. You will be notified by e-mail when new items are listed, unless you click the link that pops up that reads Don’t Send Me E-mail Alerts. If you change your mind and no longer want to follow the search, click the Following This Search link and a red x will appear. Clicking there will remove the search from your list. 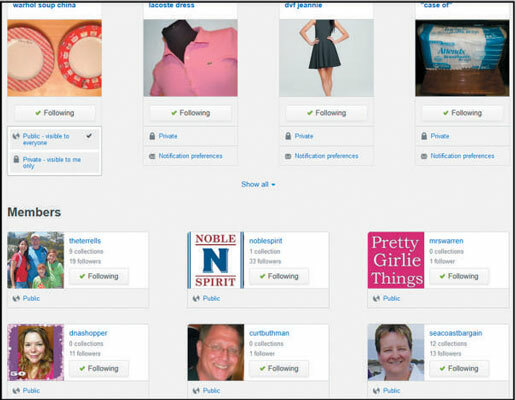 The search is saved to your Searches You Follow (Lists) on My eBay and on your Profile page as Interests. When you’ve shopped eBay and found a seller that you’re happy with (or just like their items), click the + sign next to Follow This Seller on the listing page. The seller is saved to your Sellers You Follow (Lists) page and on your Profile page. If you follow some sellers or searches because you source merchandise from them, or use them for researching products (or you don’t want the fact that you are following public), you can remedy the situation. Go to your Profile page by clicking your eBay User ID on any page. Scroll down to the Following section. Click the cog icon on the right next to the word Settings. You will be brought to a page where you can set Privacy settings for any Interests (for Searches You Follow) or Members (for Sellers You Follow). Find the Seller or Search that you wish to make private, and click the globe icon below the picture next to the word public. A menu will drop down, and you can click to change your setting to private. Once you’ve set a Follow to private, folks can no longer see it on your Profile page, but you can still reach it from your My eBay→Sellers (or Searches) You Follow lists. The Watch List may be the most active area of the My eBay page. This is the place for you to work on your strategy for getting bargains without showing your hand by bidding. In this area, you can watch the auction evolve and decide if you want to bid on it. When you come across a fixed-price listing that you don’t want to take advantage of just now, save it here for future reference. You also can list several auctions for the same item and watch them develop and then bid on the one that can give you the best deal. You can track the progress of up to 100 items in your Watch List area. Moving listings into the Watch area is easy. When you find an item that you want to keep track of, look for the Add to Watch List link, which is located on the listing page. You can also add to your Watch List by clicking the Add to Watch List link. Just click this link to transport the item to your Watch List area. Got the time? eBay does. Click the eBay Official Time link, which is at the bottom of virtually every eBay page. The eBay clock is so accurate that you can set your watch by it. And you may want to, especially if you want to place a last-second bid before an auction closes. After all, eBay’s official time is, um, official.